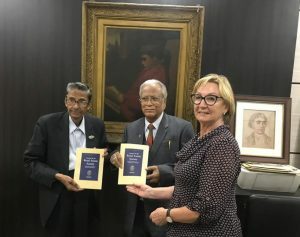 Cheryl Porter, Director of the Montefiascone Project and Fellow of the Royal Asiatic Society, visited the Asiatic Society of Bengal to deliver both our best wishes and some of our more recent publications. She is photographed here with Dr. Satybrata Chakrabarti, the General Secretary (left), and Professor Isha Muhammad, the President, with a portrait of Sir William Jones in the background, their founder. The Royal Asiatic Society offers its congratulations and best wishes to its parent society on the opening of its new building at Salt Lake City, Kolkata, dedicated to the memory of Dr. Raja Rajendralala Mitra (1822-1891), the first Indian President of the Asiatic Society and an eminent scholar of Indology. In November 1846, he was appointed Librarian and Assistant Secretary of the Asiatic Society, then served as its Secretary in 1857 and 1865, and as Vice-President from 1861. He was elected President in 1885. Very fittingly it was he who wrote the Asiatic Society’s centenary history, published in 1885. The Asiatic Society of Bengal will host a Global Meet of the existing Asiatic Societies throughout the world at their new premises on the 16th February, 2019, to celebrate the dedication of their new home. Dr. John Clarke, Curator of Himalayan and South East Asian Art at the V&A Museum, focused his lecture on the legacy of Younghusband’s 1904 expedition to Tibet and the collecting of Tibetan material. 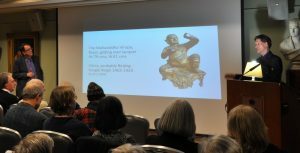 He examined the politics of collecting material from other nations, the systems of gift, purchase and appropriation which historically have occurred, whilst also delighting his audience with some of the treasures held within the V&A Collections. These included some horse armour made from forged and pierced iron, and leather, dating from 1400-1800, and given to Sir Charles Bell by the 13th Dalai Lama in Darjeeling in 1910 during his exile from Tibet. This can currently be seen at the Royal Armouries Museum, Leeds. 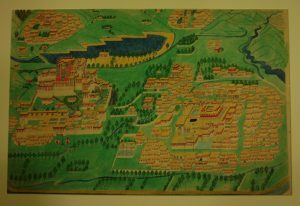 Within our Collections we also have some material connected to Tibet. Many of you will remember the Thomas Manning Archive that came into the Society in 2015. 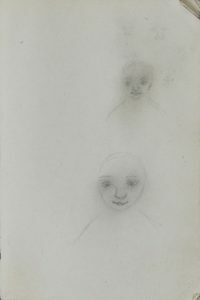 The full archive is digitised and available on our Digital Library but I wanted to highlight Manning’s delightful sketches of the ninth Dalai Lama, who he met when he was in Lhasa trying to complete an overland route to China. Manning’s account of his trip to Tibet was posthumously published by C. R. Markham in 1876 as part of the”Narratives of the Mission of George Bogle to Tibet and of the Journey of Thomas Manning to Lhasa”, but our archives contain a handwritten manuscript which contains additional material and draws from the diary entries in some of the notebooks also in the archives. Full details of the Manning Papers are available on Archives Hub along with our other catalogued archival material. This painting was given to the Royal Asiatic Society in 1891 by W. Woodville Rockhill and it was featured as a full colour illustration in the first of two articles by Rockhill in the Journal of the Royal Asiatic Society, 1891. Rockhill, an American diplomat known as one of the arbitrators of the Open Door Policy for China, was resident in Peking for four years, during which time he studied Chinese sources on Tibet. With the aid given “by a good Chinese sien-shung and a very clever Tibetan lama”, Rockhill sought to translate and discover as much as he could about Tibet. He distills this information into two detailed articles in the January and July editions of our Journal. The picture itself measures 63 x 99.4 cm and is paint on paper with highlights of gold paint, unfortunately difficult to see in this reproduction. We also have several of Rockhill books within our Collections, details of which can be found on our Library Catalogue. The next lecture to be held at the Society is on Tuesday 19th February, 6.30 pm, when Dr. Oliver Crawford (University of Cambridge) will lecture on “The Languages of Indonesian Socialism”. Further details can be found on our website.